At approximately 15:00, thousands of civilians, including women, children and entire families, started swarming to the five encampments established by the Supreme National Authority of Great March of Return and Breaking the Siege adjacent to the border fence with Israel in eastern Gaza Strip cities. Hundreds, including children and women, gathered along the border fence with Israel in front of each encampment and protested between tens and hundreds of meters away from the border fence. In seevreal area, the demonstratorsmoved hundreds of meters away from the encampment to protest in front of the border fence with Israel, and some of them attempted to throw stones at the Israeli forces in addition to chanting slogans. In very limited incidents in Rafah, a group of demonstrators approached the border fence and set fire to tires. 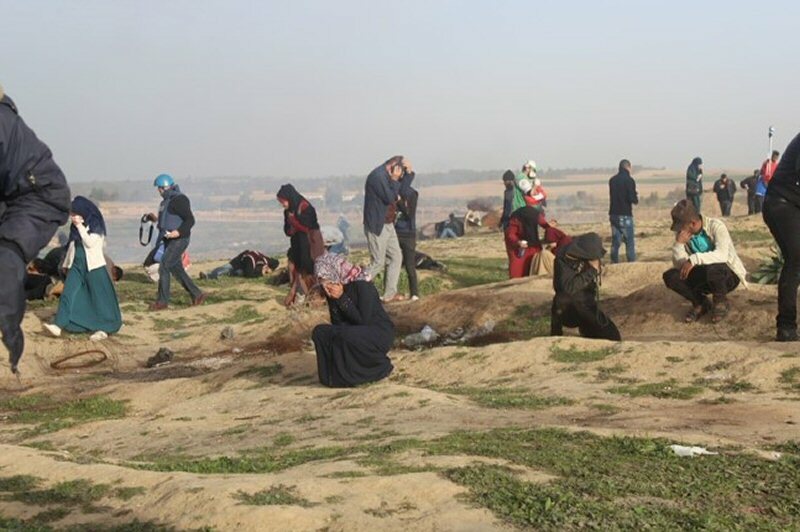 Although the demonstrators gathered in areas open to the Israeli snipers who were stationed on top of the sand berms and military watchtowers and inside and behind the military jeeps, the Israeli forces fired live and rubber bullets in addition to a barrage of teargas canisters at them. The Israeli shooting, which continued until around 17:30, resulted in the injury of 98 Palestinian civilians, including 15 children, 4 women; 2 of them were paramedics, and a journalist. The injury of 7 of those wounded was reported serious, including a 17-year-old girl who was shot with a bullet to the chest in eastern Khan Younis. Moreover, dozens of demonstrators, paramedics and journalists suffered tear gas inhalation and seizures due to the tear gas canisters that were fired by the Israeli forces from the military jeeps and riffles in the eastern Gaza Strip.